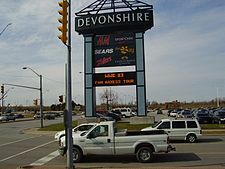 There are several motels along Howard Ave within a couple of kilometres of Windsor’s largest mall, Devonshire, with the Roundhouse Centre retail plaza across the street. With the Canadian dollar lower, this might be the time to pitch tourist packages to draw statesiders to this regional mecca of Canadian retail, which boasts numerous stores that simply don’t exist in the United States. Devonshire marketing director Karen Niforos said it’s a “great idea” and she might consider it for next year’s marketing plan because this year’s has been drawn up. “Advertising over there as you know is very expensive but it’s something to look forward to,” she said. Up to now the mall has made limited forays to attract American customers, such as bus tours. And now bus companies “have been calling us” and many will start arriving once spring is here, she said. Niforos likes to point out that Canada has a rich history in retail that differs from the U.S.
“We’ve got some really great stores and we’ve got some really great Canadian content,” she said, making references to businesses like Roots and Hudson’s Bay Company. Niforos said that more than a decade ago a more aggressive program was tried. The mall and the local tourist agency have a healthy relationship. Tourism Windsor Essex Pelee Island has a booth there on weekends to promote to “not only visitors to the mall from outside the region but also our home town” tourists, CEO Gord Orr said. And later this month there will be a “tourism megaplex” at Devonshire. Orr said his agency doesn’t promote tourism retail packages. But Orr said the mall is a “huge partner of ours” with an ad inside the cover of the agency’s visitor’s guide, “and free complimentary space to host a visitor information specialist part time on the weekends." Orr said there is nothing to preclude hoteliers and retailers from joining forces on their won to pitch U.S. shoppers for weekend excursions.